Beyond the white elephant gift exchange, cubicle decorating contest, and egg nog growing mold in the break room, the Christmas season in the corporate marketing department is a time for reports, reflection, and planning for next year’s success. But this year a new tradition is born, as corporate marketers all over the world get to join together in perfect harmony and try to explain amidst the tinsel and sugar cookies what the $%#@$ is up with Facebook. The decline of organic reach and the threat of further declines in January when promotional posts are penalized have turned the season of joy into the season of confusion and uncertainty. Corporate marketers that bought into Facebook’s long con of free exposure spent the past three years using their fan counts, PTAT, reach, and engagement rate metrics to convince their C-Suite bosses that all was healthy in the social media department. But now, like a King taking back the Myrrh, Facebook has unilaterally decreed that the tactics that built those successes – that made prior Christmas seasons joyful in the corporate marketing department – are no longer valid or viable. Now Facebook says that companies must provide useful content if they want to continue to receive free distribution. Messages that are promotional in nature will be hidden away and swaddled in the News Feed manger until companies whip out the credit card and set those messages free in the form of paid ads. For many corporate marketers, these are major shifts. From free to paid. Free promotional to useful. Free big audiences to niche audiences. From Facebook as a customer acquisition vehicle to Facebook as a customer retention vehicle. But we know what the C-Suite doesn’t know. We know that this isn’t YOUR fault, it’s Facebook’s fault, right? They changed the rules, and you have to play by them.We know that we might not be able to use Facebook contests to generate new likes, and that maybe we should worry less about likes and more about something more stable like email addresses, right? We know that now that Facebook has proven this “freemium” exposure model works, that the same thing is likely to happen at Twitter, Instagram, and Pinterest, right? We know that we shouldn’t build our brand’s customer communication house on rented land, right? We know that maybe social media isn’t really about selling stuff to new people, but about finding a way to connect with current customers so that they’ll buy more often, right? These are the things that must be explained. So put down the cocoa and march on in to that conference room and set the record straight. Rework the KPIs. Shift the strategic plan. Redeploy resources. It’s a hassle, and it’s hard to tell the C-Suite that the game has totally changed. But take solace in the fact that many corporate marketers are hearing the same jingle bells and singing the same carol. 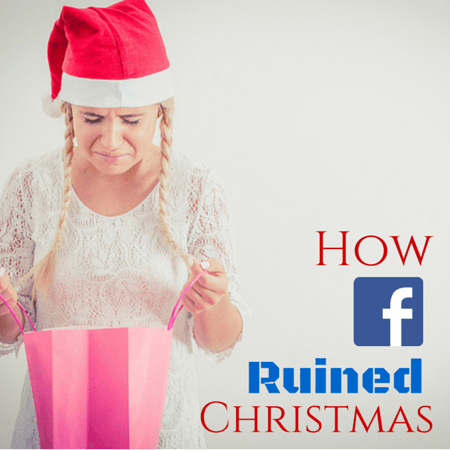 And that’s why Facebook ruined Christmas.